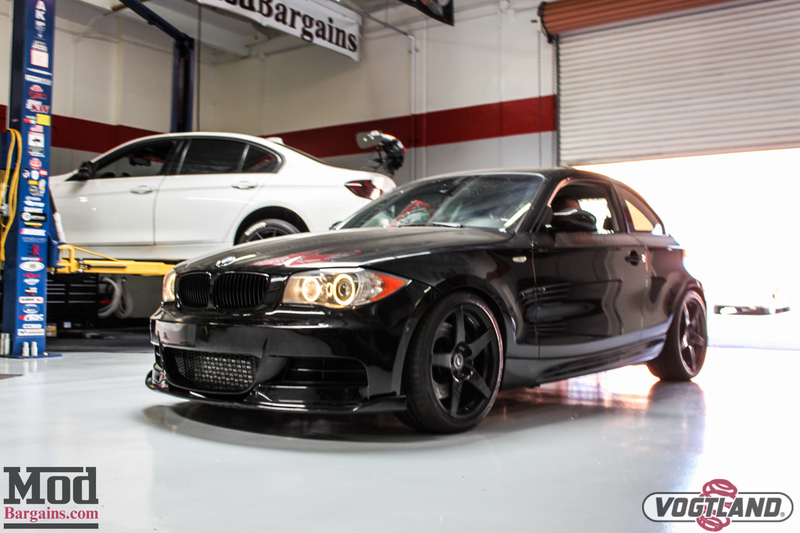 Full-Bolt-On in 1 Day: BMW E82 135i ER FMIC, Chargepipes, ARK Catback, Injen Intake + More! 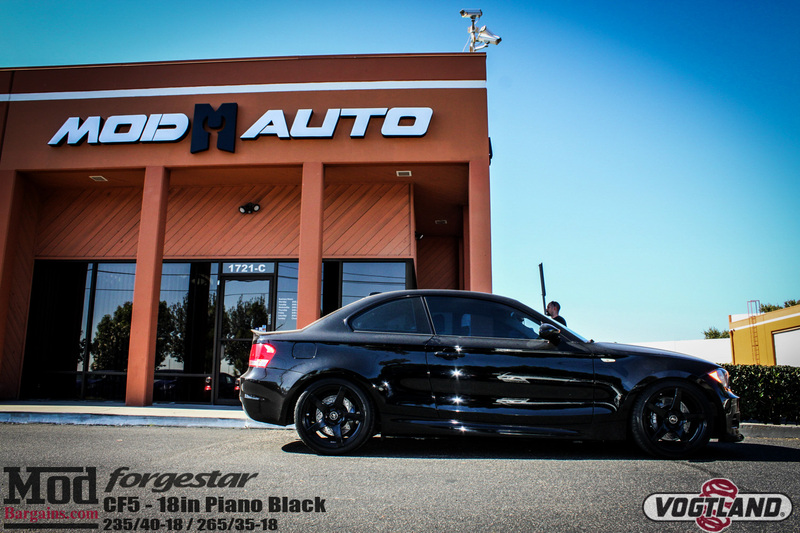 Just a few days ago this E82 BMW 135i rolled in sporting a few mods, but basically stock under the hood. 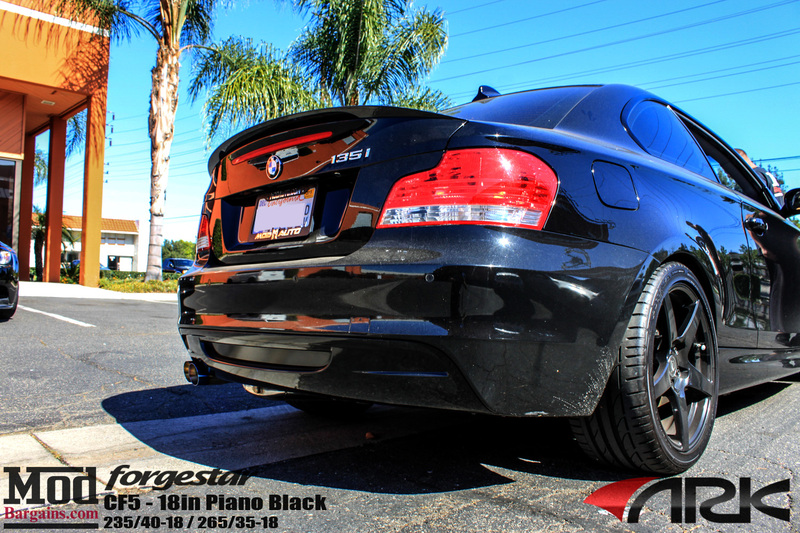 Already lowered on Vogtland Springs for E82 135i and rolling on a set of 18in Piano Black Forgestar CF5 wheels for BMW E82, Clarence C’s 135i was off to a good start, but today he’d brought the car to Sr Mod Expert Alan Wei to seriously crank up the performance of the N54 under the hood. 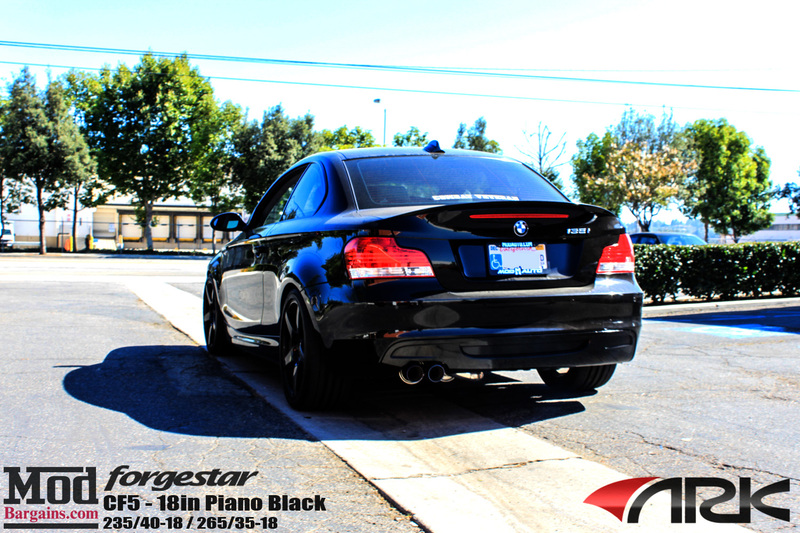 Taking cues from our Best Bolt On Mods guide for BMW N54 Motors and our Best Mods for the E82 135i Guide, the Mod Experts gave this car an eye-opening power increase. Here’s how the engine bay looked before we got started – almost everything on the intake side of the motor’ll be swapped out by the time we’re done. Seeing as the E82 Suspension and Wheels had already been upgraded, The first order of business for today’s install was to replace the undersized OEM intercooler with an Evolution Racewerks Competition Front Mount Intercooler for BMW N54 135i models, which typically yields a +25whp gain on most tuned cars thanks to the lower charge temperatures alone. 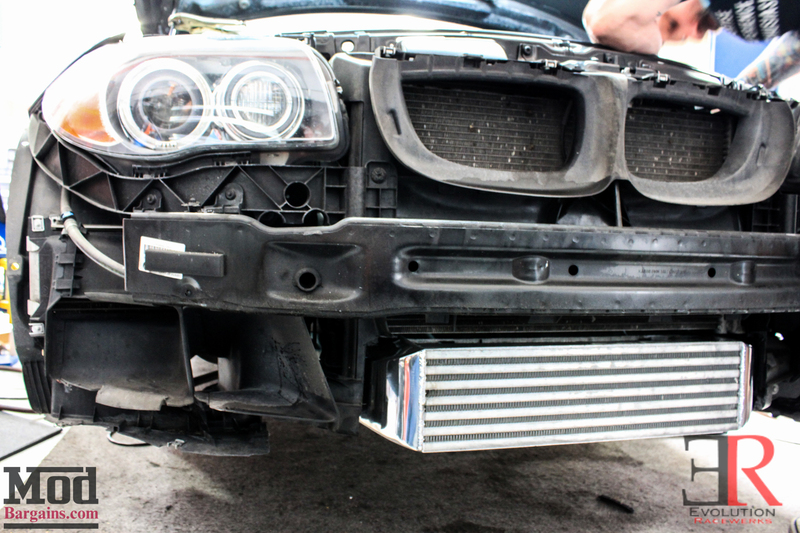 In addition to the ER Competition Intercooler for BMW N54, we also had a few other goodies in store – like an induction upgrade from Injen Technology – the Injen Cold Air Intake for N54 BMW 135i models, an Evolution Racewerks BMW N54 Chargepipe with HKS SSQV (aka Diverter Pipe), a Cobb Tuning AccessPORT V3 for BMW N54 135i for the customer to load the correct map for himself, and Mishimoto’s new Baffled Oil Catch Can for BMW N54 models. And that’s even before we mention the R1 Concepts Drilled & Slotted Front Brake Rotors + Pads and Drilled & Slotted Rear Brake Rotors and Pads for BMW E82 135i. 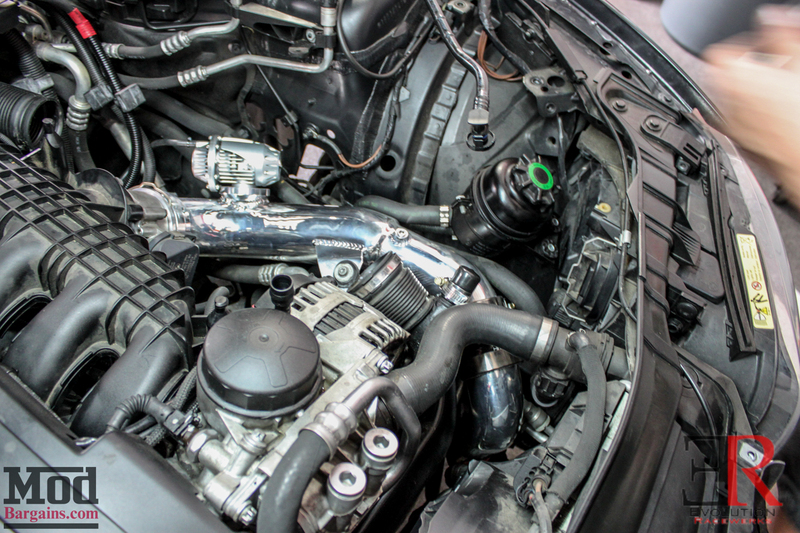 It just so happens that the Injen Intake for BMW N54 is one of the very few CARB legal Intake upgrades on the market. That little sticker on there means that your Smog guy can’t hassle you for the intake when it’s time for CA emissions testing. As we mentioned, the car was getting a brake upgrade from R1 Concepts as well. 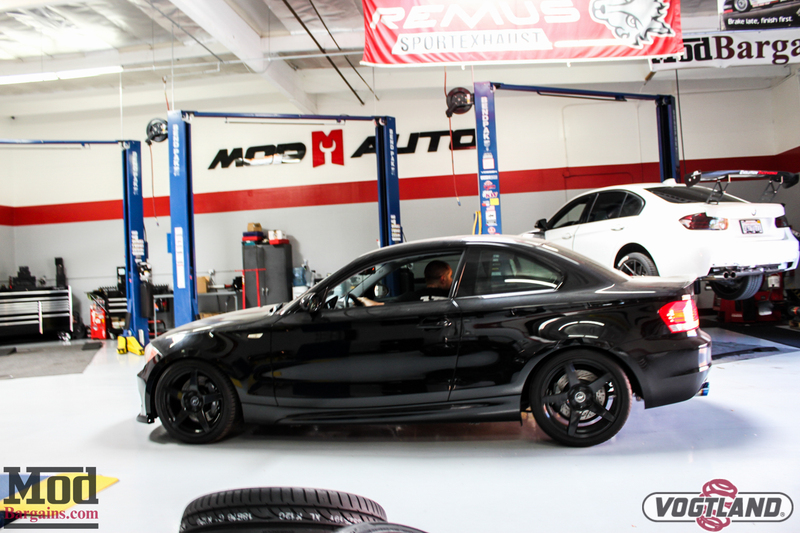 Our expert techs at ModAuto (our install facility) made quick work of removing the front bumper and the OEM intercooler – from this angle you get a great view of the R1 Concepts Drilled & Slotted Front Brake Rotors for E82 BMW 135i. When you order a set of Rotors from R1 Concepts, each set of rotors comes complete with matching performance compound brake pads for a complete installation. The Cross-Drilling in the rotor helps vent hot brake gases, keeping the rotor cooler, and the slotting helps keep the face of the pads clean and free of debris, and the added surface area helps improve ventilation as well. We didn’t skip the rear, either. Here’s the R1 Concepts Drilled & Slotted Rear Rotors & Pads for E82 BMW 135i. 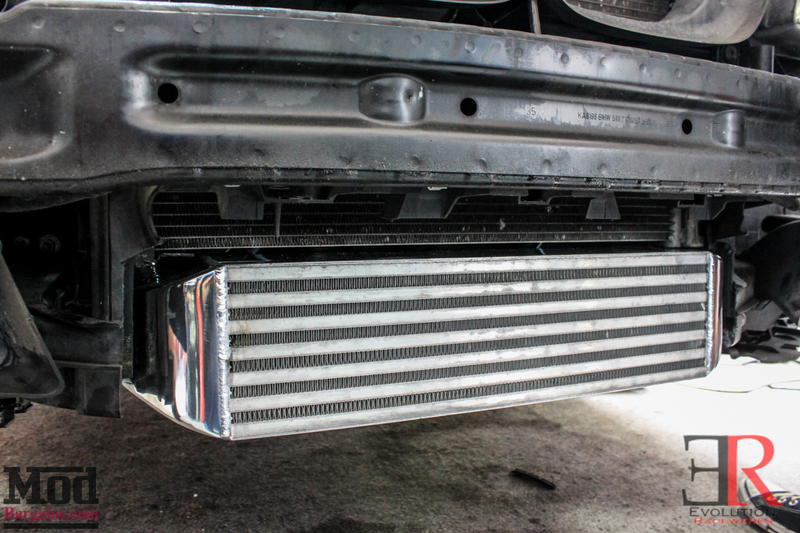 We quickly mated up the Evolution Racewerks Competition Intercooler for BMW N54 to the front end of the 135i, and it fit right in there like a glove. Check out the fitment – it fills every inch of that space it possibly can. Before we got around to installing the intake, we took care of the chargepipe that lives beneath it. It just so happens that all of the OEM chargepipes are now starting to get old and brittle enough to fail, meaning if it’s not leaking boost already, it might start soon, so upgrading the chargepipe is a great idea for preventive maintenance. 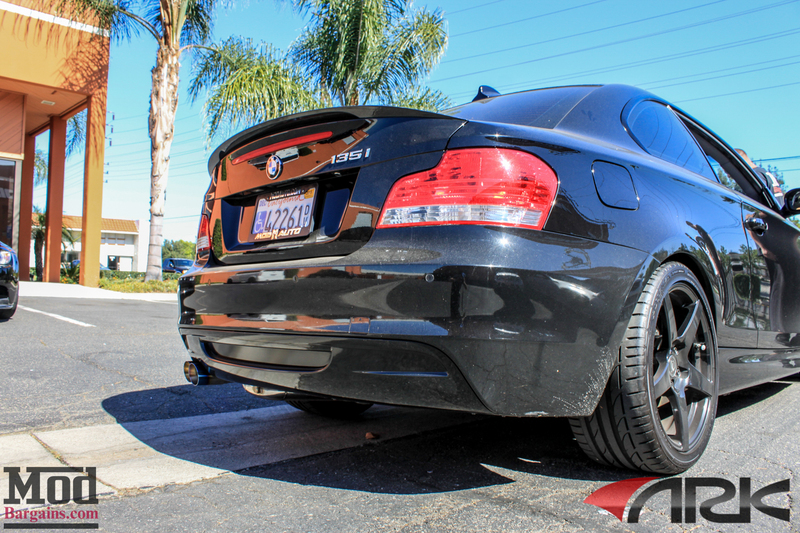 Alan recommended Clarence opt for an Evolution Racewerks BMW N54 Chargepipe (Diverter Pipe) fitted with the optional HKS SSQV Blow-Off Valve. The HKS SSQV is reputedly one of the best blow-off valves on the market, and seeing it fitted to the chargepipe does indeed look impressive. 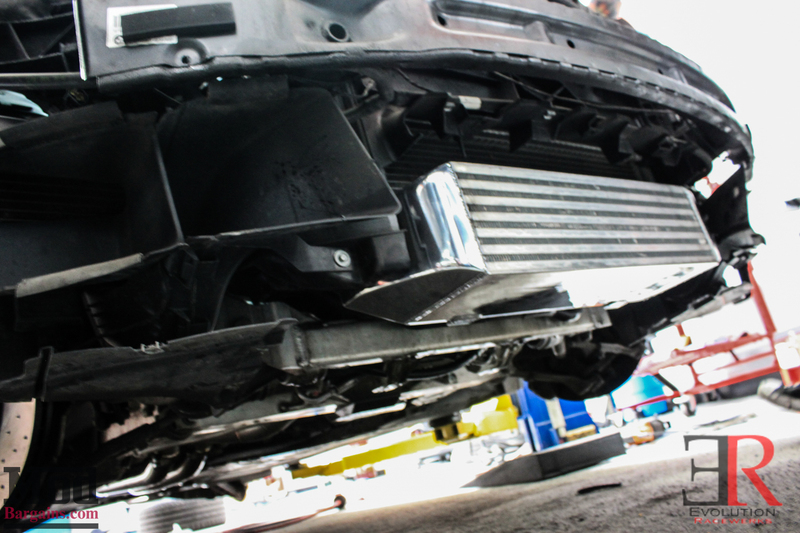 Next up for install was the Injen Technology dual cone intake for BMW N54 engines – good for an additional 10whp / 10wtq – and that’s without a tune or any supporting upgrades. We weren’t done yet – even though the Injen Intake for BMW N54 was installed, we weren’t sure if we’d have enough clearance to install the all new, Direct-Fit Mishimoto Baffled Oil Catch Can for BMW N54. With a little clever re-positioning, the Mishimoto Baffled Oil Catch Can for BMW N54 fits even with the Injen Intake installed. An Oil Catch can is a great idea for any tuned direct-injection turbocharged car (like all modern turbo BMW engines, all Ford EcoBoost engines and so on) – it helps catch the oil vapor that otherwise accumulates and coats the inside of the intercooler, your chargepipes and critically- your intake valves in the cylinder head with oil, soot and gunk. What this means is that over time, the oil buildup acts like fatty buildup in your arteries, restricting blood flow – except it’s restricting air flow, hampering throttle response and power. It’s for this reason BMW recommends Walnut Blasting every 40,000 miles – less if you’re tuned, due to the sheer amount of crap and carbon buildup. We’ve been doing the walnut blasting service for some time now and we’ve been shocked to see just how MUCH crap builds up in the intake valves. One particular car had nearly 2mm of oily crap in each intake port. 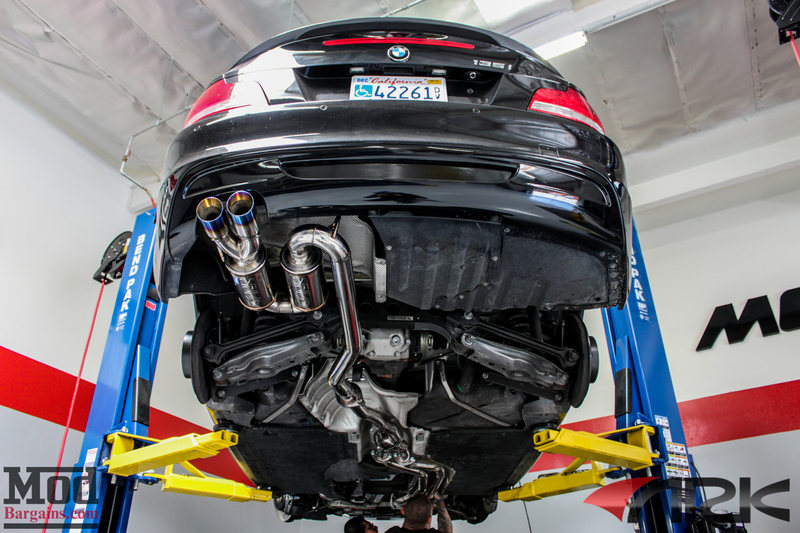 Freeing up the flow of exhaust gases and enhancing the tone of the 135i is an ARK Performance DT-S Cat-Back Exhaust System for BMW E82 135i. 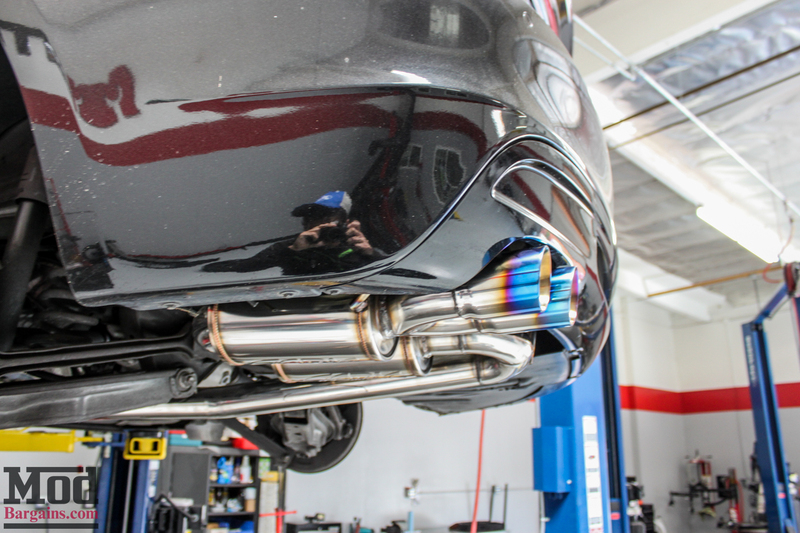 This mandrel bent system offers an aggressive exhaust note and significantly improved horsepower and torque. Here’s the full view of the ARK DT-S Catback for BMW 135i from below. 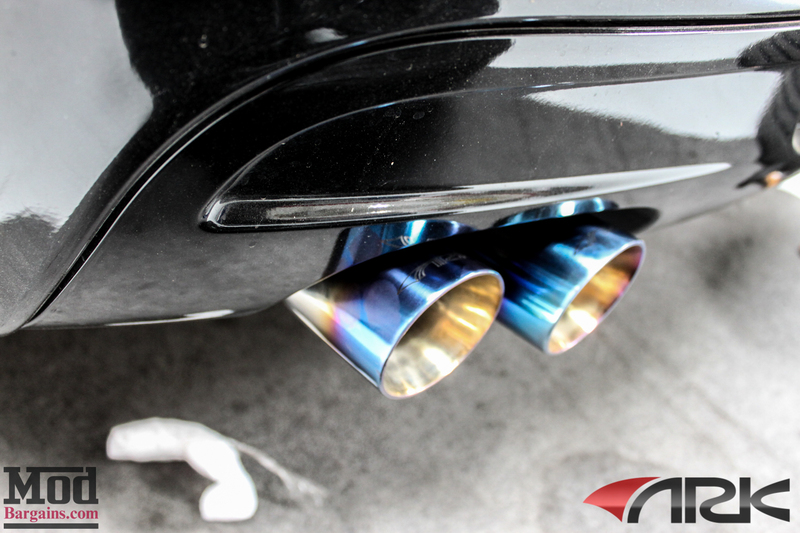 The ARK DT-S exhaust features burnt-titanium style tips for a unique ‘JDM’ kind of look. Here’s a closer look at those ARK tips. 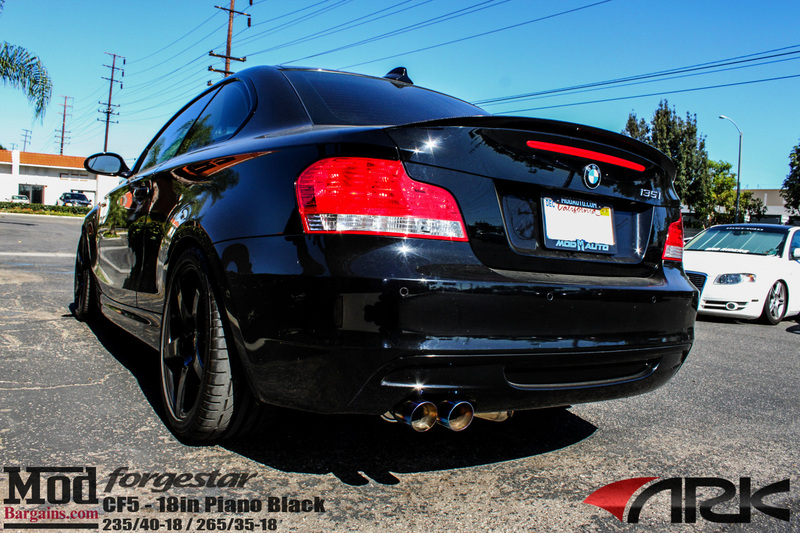 The Carbon Fiber Trunk Spoiler for BMW E82 135i is a nice subtle touch. From the side profile view, we can get a better idea of the drop of the Vogtland Springs. 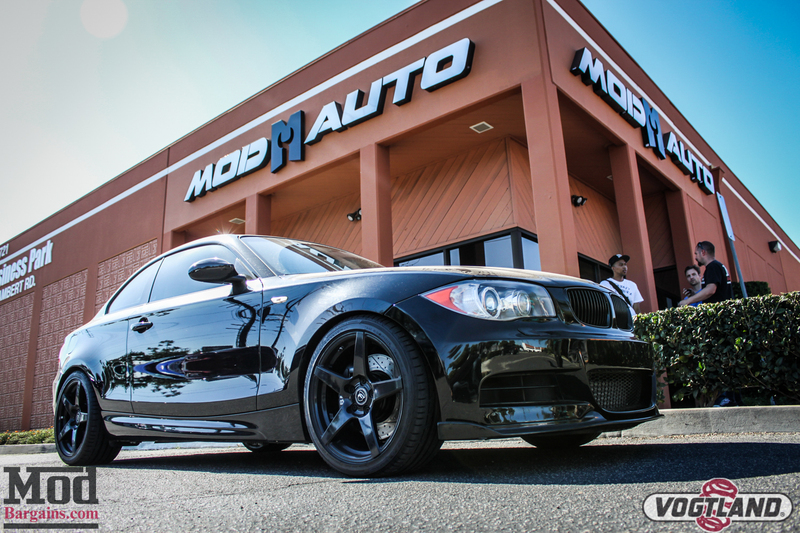 Can we mention just how much we like that HM Style Front Lip on this 135i? The Canards at the ends really “make” the look. With the car back in the sun, we could better appreciate our handiwork. 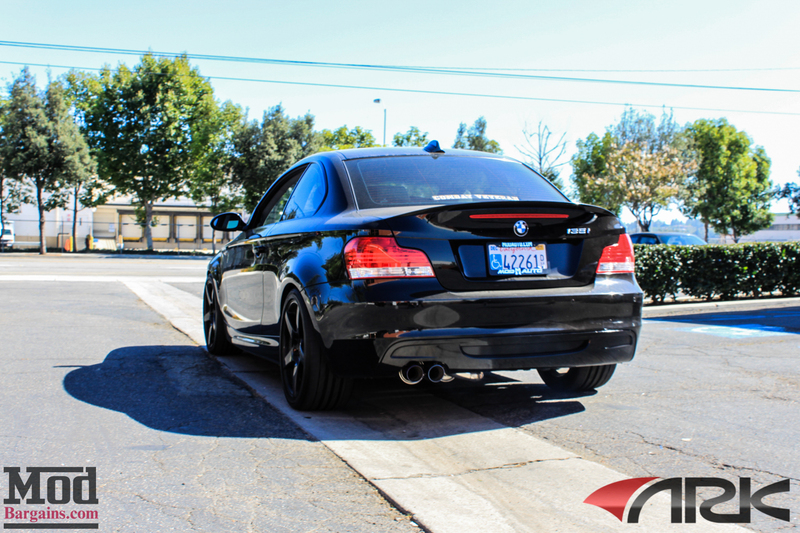 The Evolution Racewerks Intercooler for 135i peeks out from behind the bumper just enough to let you know it’s there. 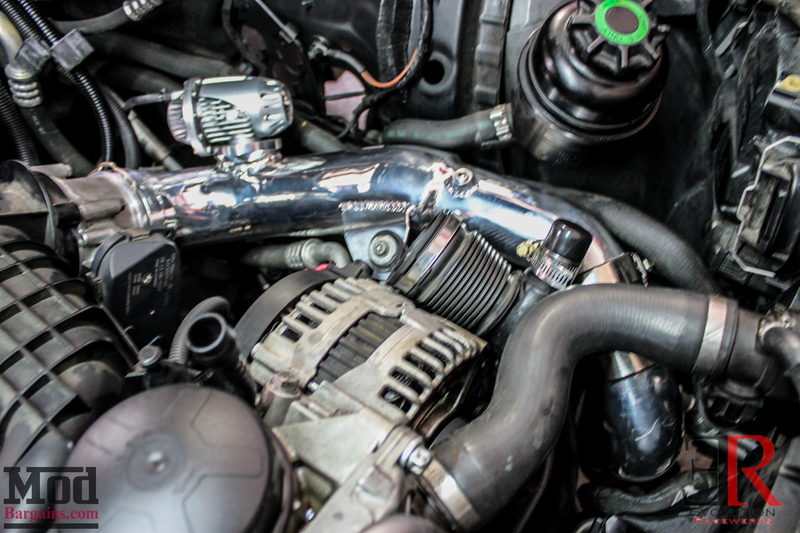 The Injen intake looks perfectly at home, as does the Mishimoto Oil Catch can. That’s one tidy-looking modified engine bay. The Piano Black Forgestar CF5 wheels looked fantastic as ever in the afternoon sun. Take a look for yourself. 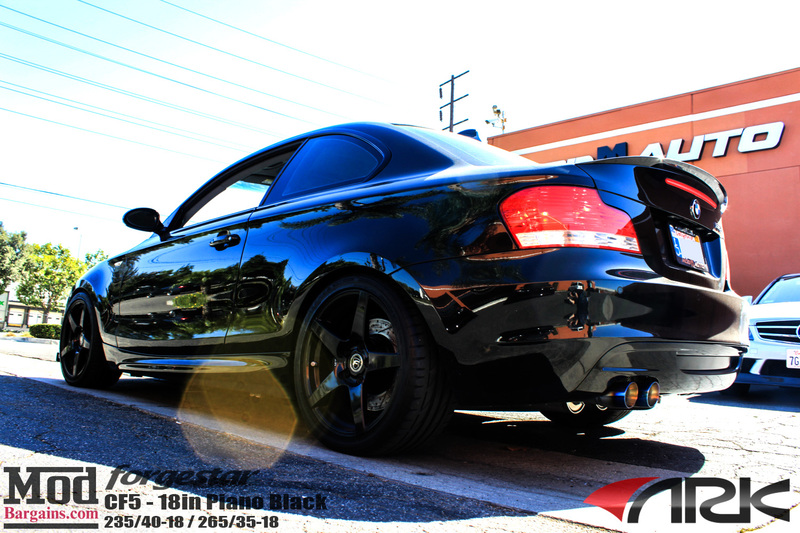 In a single afternoon Clarence made a night-and-day change in the power and performance of his 135i, and we can do the same for your E82. 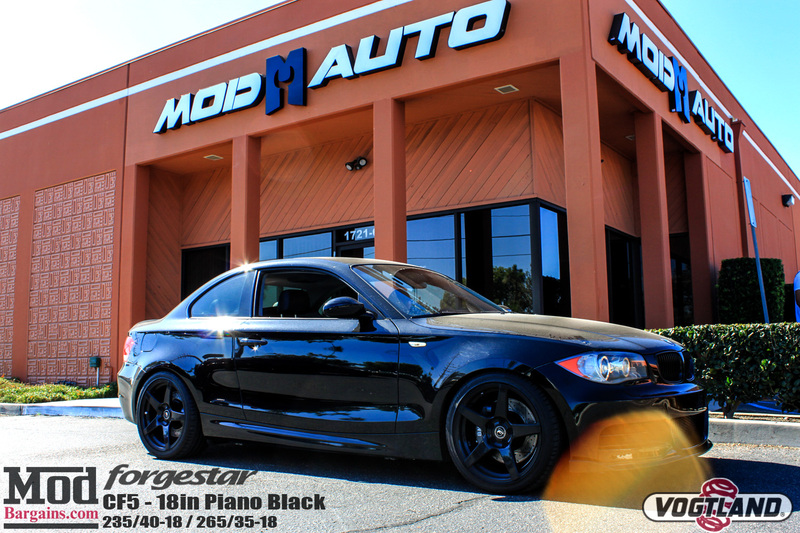 Interested in modding your 135i? 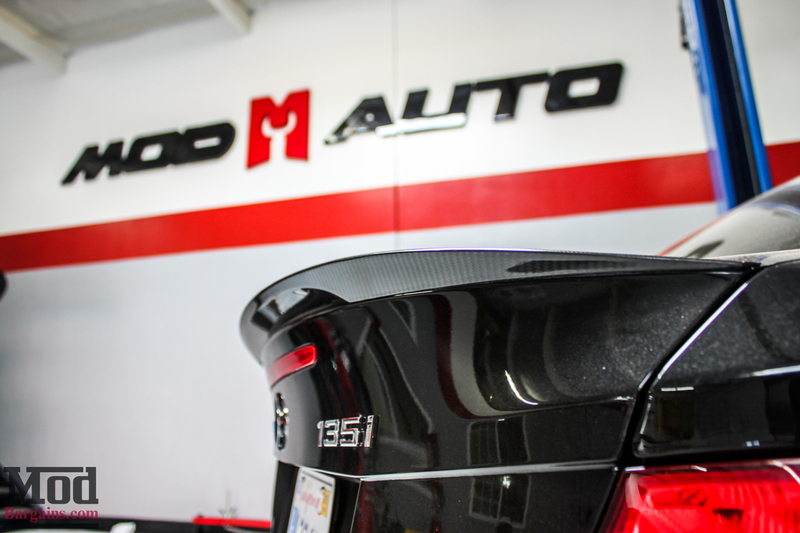 Talk to our Mod Experts like Alan, give us a call at 714-582-3330 (x8006 for Alan), chat live on ModBargains.com or just stop by the ModAuto showroom in La Habra, CA any day during business hours to see what we can do for your ride. Thanks for reading, and we’ll see you next time!